Malaysian artists, animators, and storytellers will have an opportunity to showcase their work at the upcoming Visual Arts Expo (VAX) held in the Mines International Exhibition and Convention Centre (MIECC) on 21-23 August. Visitors to the expo will also have the opportunity to attend concerts and meet animation industry superstars. VAX aims to be the one stop location for creatives to gather and present their work to creative industry players from Japan, America and Europe. The ultimate goal is to get this work picked up and used by the professionals as part of their own projects. The expo targets an audience of school leavers, fresh graduates, young adults and entrepreneurs, and will present the content in various forms – which includes animation, comics, video games and also music. For the average visitor, there will be seminars and panels; including talks from Japanese studio Gainax. There will also be a performance by Aimee B, who has songs featured in shows like Kill la Kill, Aldnoah.Zero, and Guilty Crown. Organisers will be holding separate spaces for hobby workshops on model painting, drawing, and even prop making. 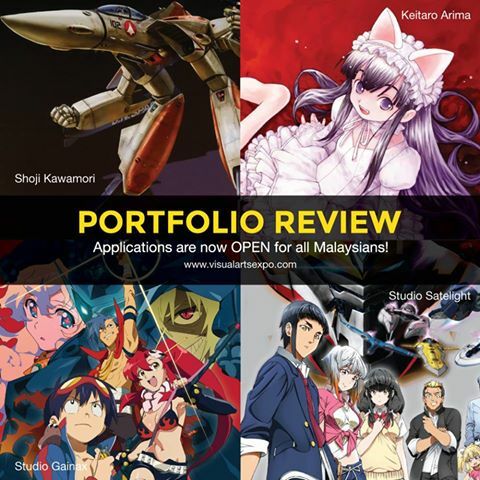 At the moment, VAX has also opened applications for Portfolio review sessions. These sessions will allow applicants to sit down with Japanese animation industry heads and have their portfolio looked over. There are limited slots, and the lucky few will be chosen by a lottery system. Tickets for the event will be priced at RM 15 per day for walk-in visitors, or RM 25 for two days when purchased online. Tickets are available for purchase from MSpace, and will be made available from retail partners, Borders and Spartan Games Arena soon. A limited run of 200 VIP passes are also being sold through the VAX website for RM100, which allows holders to skip lines and gain priority access to the concert.